Concerts blend music and words to create the atmosphere of the old church bands performing in and out of church. Lively, amusing and informative. Workshops give you an opportunity to sing and play this music with us, and may conclude with a church service or short concert. Here is a report and recordings made at Emery Down in a workshop of New Forest Carols. Thanks to Forest Tracks and Paul Marsh. We can provide suitable music for all Services in the Book of Common Prayer. Here is a wedding. 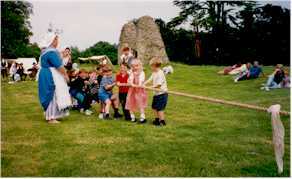 A village wedding celebration with dancing and games. Wassail, Mummers Play. Here are some recordings made by Paul Marsh at Manor Farm of singing, playing, dancing and a mummers play.